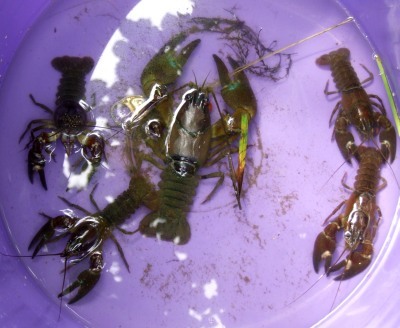 One unwelcome invader to our rivers is the North American Signal Crayfish, a ferocious cannibal that will eat anything that comes its way, fish eggs, ducklings, young Moorhens and has all but finished off our indigenous species. 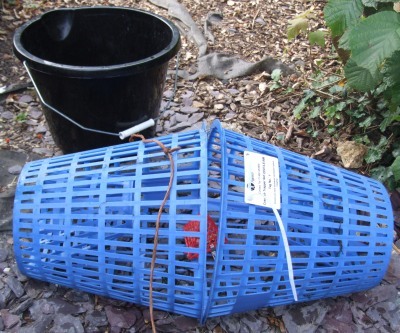 Apart from doing harm to our wildlife they can collapse a river bank by their constant burrowing. The River Ock has its share of this monster and Steve has been doing his best to control them (over 100 in 3 days from a 10 meter stretch) You have to be licensed by the E.A to catch them and putting them back is forbidden, (failure to comply carries a hefty fine) but they do make for good eating! 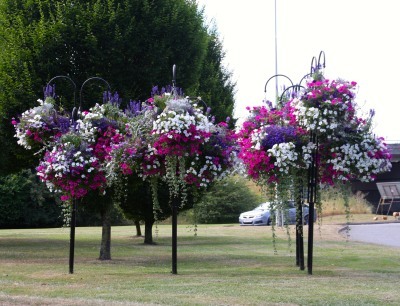 Spike sent some pictures of the floral displays in Abingdon this summer. 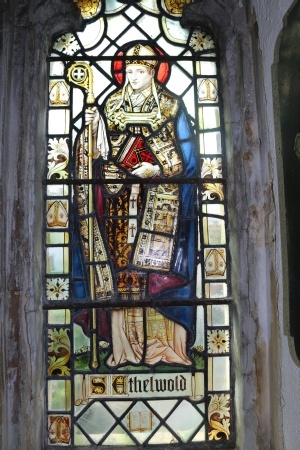 On a recent visit to Winchester we saw a stain glass window in a chapel showing St Ethelwold. 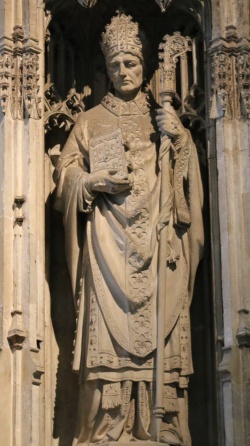 Ethelwold was Abbot at Abingdon Abbey before becoming Bishop at Winchester in 963. There was also an image of Ethelwold on the large Cathedral Screen. He would have been Bishop before the current Cathedral was built and so we could not find his tomb. Even if St Ethelwold was buried at Winchester his bones would not be easy to find. 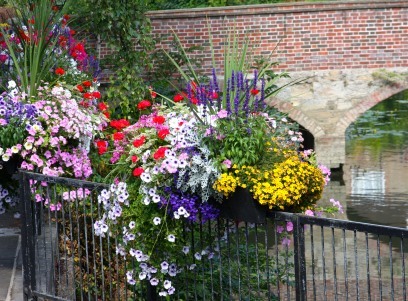 During the time of King Henry VIII all the bones and relics from saints and others had been dug up and dumped in a pit. The large stain glass windows at Winchester Cathedral were deliberately smashed by Cromwell’s forces, some time later, during the Civil War. 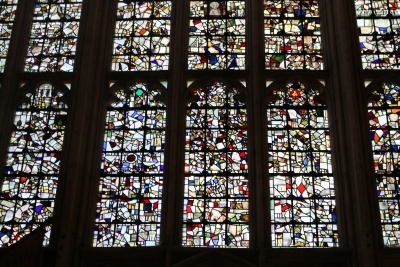 After the restoration of the monarchy in 1660, the broken glass was gathered up and assembled randomly, and now looks like a modern art window. A guide told us that historians are still trying to identify some of the old bones using DNA. 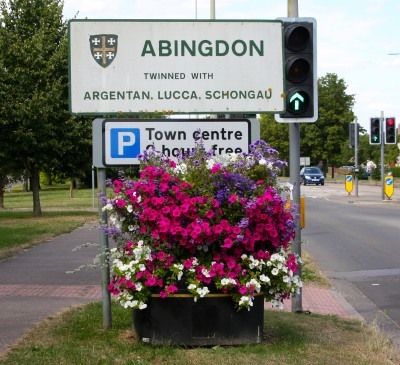 An update on the Jobs Fair this Wednesday (30/07/14) at the Guildhall. 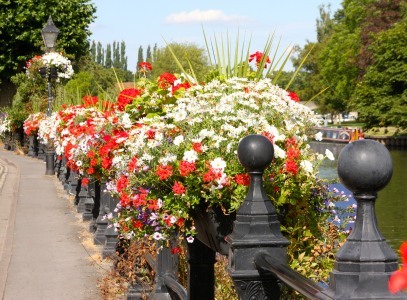 The event will be open to the public from 10:00am – 2:00pm, entry is free. So good luck for all those looking for a job. 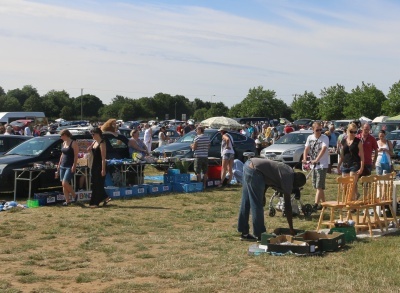 There was a Big Car Boot Sale at Peachcroft Farm this morning – as there is from 9:30am – 1:00pm every Sunday. 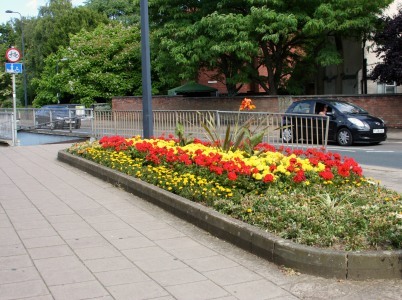 Some stalls raise money towards a cause such as a team challenge project. Some stalls are commercial. 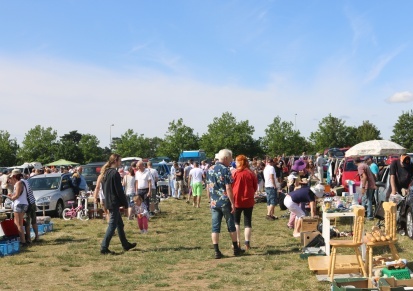 But most stalls appear to be people wanting to have a clear out, and to make a bit of cash from their old belongings. 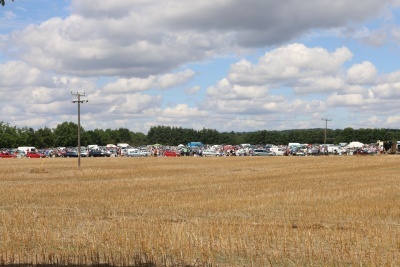 Under this morning’s hot sun there were lots of customers making their way up and down the rows and rows of cars. Lots of people seem to love the thrill of the search. My wife in particular was in her element, picking out bargain after bargain.